Ideal for two couples or two families to share. Enjoy the outdoor experience and use the three push bikes to check out your new surroundings and try your luck fishing with the two fishing rods! Books and board games available for those chill out days. Or push the single beds together to make a king bed . A set of King linen available upon request. Lock up garage available to store rods etc overnight. Linen - Please bring own sheets, towels, beach towels, hand towels and t-towels. Autumn/ Winter/ spring rate if more than 4 adults - extra per person per night rate applied from $10 . King sheets are available if required. Premises need to be vacated by 10.00 am on your final day. This is a very homely feeling, warm and cosy bach. There's a huge range of toys and games for all ages and the kitchen is very well equipped. Great backyard too, ideal for kids to run around in but also providing lovely sitting areas. Overall, a very enjoyable experience! Awesome holiday home. Well equipped. Clean and close to everything. Thank you for a lovely stay. We were two couples and a grandmother attending a family wedding. We came through the French doors into a spotlessly clean bach, the warm glow of the wooden floor welcoming in to the well appointed bach. 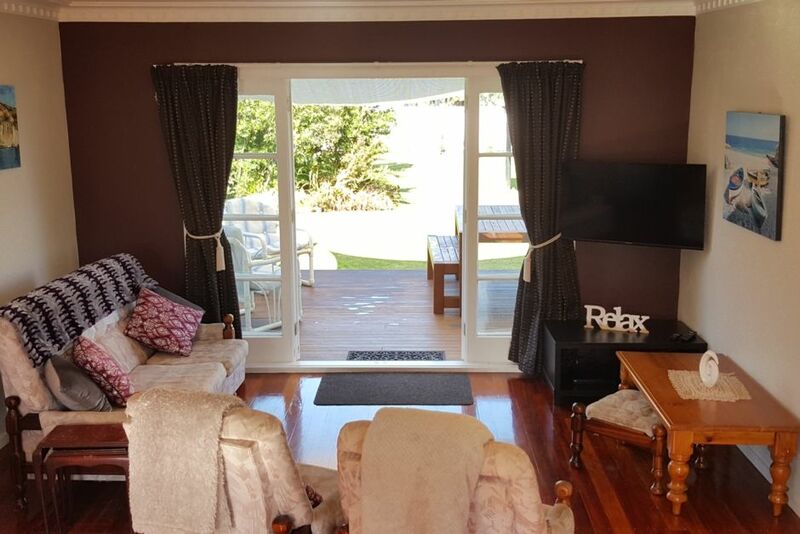 The main living room is roomy with the three bedrooms off to each side. The kitchen has been refitted and is very well stocked with everything you need. Tracy did a great job of sending details of how to get into the house and what to do when we left the house. All very clear. We highly recommend this bach as a comfortable, good value stay. Another excellent holiday, such a lovely property so well maintained and looked after. We enjoyed watching DVD's and drinking cocktails on the back deck. went to salt for lunch and took a ferry trip over to eggcentric which is always good. looking forward to our holiday next year. Classic kiwi bach! Great location.